The Metropolitan Transportation Authority is speeding up the installation of “Positive Train Control” at Metro-North. If it had been in place, the system would have prevented the Dec. 1 derailment that killed four people, including James Lovell of P… Please login below or purchase a subscription to the Putnam County Courier to access this content. 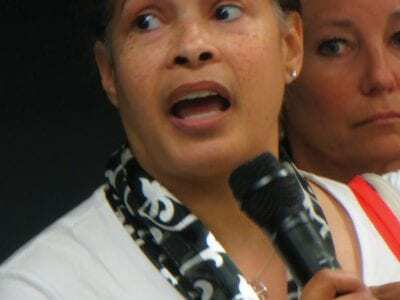 A parent’s worst nightmare: Chanelle Faraselli talks about burying her 24 year old son two weeks ago due to a heroin overdose. Putnam’s heroin scourge has reached epidemic proportions with 38 young people fatally overdosing since 2012 and… Please login below or purchase a subscription to the Putnam County Courier to access this content. County government has kicked off a new initiative— Keep Putnam Farming—that will connect farmers and neighbors to better understand existing agricultural conditions across Putnam while building relationships in order to strengthen the ec… Please login below or purchase a subscription to the Putnam County Courier to access this content. The case of the missing benches has been resolved. For years, the temporary seating had been housed at two locations at the Putnam Plaza Shopping Center allowing for shoppers and pedestrians to sit and wait for a Putnam Area Rapid Transit (PART) bus… Please login below or purchase a subscription to the Putnam County Courier to access this content. Kristen Mancini and her three year old daughter are planning to travel abroad this summer. The Stormville residents were among the first on line Saturday at the County Clerk’s Office in Carmel to apply for passports during Putnam Passport Day. … Please login below or purchase a subscription to the Putnam County Courier to access this content. Pictured from left to right: Carmel Town Supervisor Ken Schmitt, Michelle Laga, Emily Lavin, Alana Belkevich, Ashlee Belkevich and Senator Greg Ball. 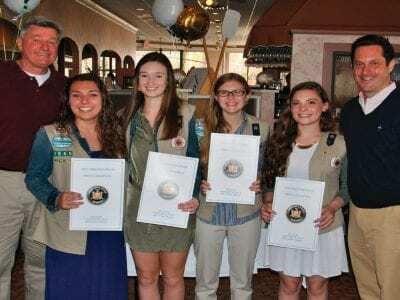 Senator Greg Ball (R, C, I – Patterson) presented four girls from Mahopac Girl Scout Troop 156… Please login below or purchase a subscription to the Putnam County Courier to access this content. Color guards carry Old Glory during the ceremony. 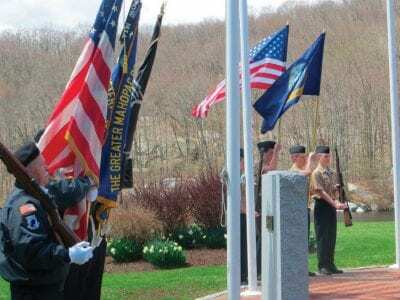 Scores of veterans and their families gathered at the Putnam Veterans Memorial Park in Kent Sunday to celebrate Loyalty Day—a day set aside to remember all veterans—those currently serving… Please login below or purchase a subscription to the Putnam County Courier to access this content. The Front Street Gallery, located at 21 Front Street in Patterson, is hosting the following art courses: May 4, 18, June 8, 22: ‘Kids Painting with Ink. The class is limited to 4 students, suggested age being 6-11 years old. 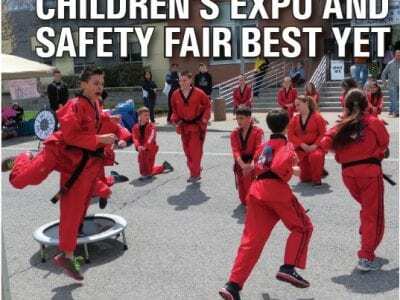 Participants will … Please login below or purchase a subscription to the Putnam County Courier to access this content.